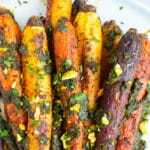 Roasted rainbow carrots are tossed in a spicy blend, served over goat cheese and topped with a homemade pistachio pesto. Toss peeled carrots in 2 tablespoons olive oil and place on a parchment paper-lined baking sheet in a single layer. In a small bowl whisk together cumin, paprika, cinnamon, turmeric, coriander, cayenne pepper, and ½ teaspoon salt. Sprinkle seasonings over carrots and toss to combine. Cover carrots with aluminum foil and bake in oven for 10 minutes. Remove foil and continue roasting carrots for 25-35 minutes or until fork tender. When carrots are done roasting, drizzle 1 tablespoon honey and squeeze the juice of ½ lemon over them. Add basil, nuts, yeast, garlic, lemon juice, and salt to the bowl of a food processor or high-speed blender. Pulse 5-10 times. Turn processor on and drizzle in olive oil until pesto is to your desired consistency. Spread goat cheese on a serving tray, place carrots, drizzle pesto, and top with additional pistachios and chopped parsley. Serve immediately and enjoy! This recipe is for whole carrots. If you have baby rainbow carrots reduce your bake time to 20-25 minutes. If you are not vegan or dairy-free, you can use Parmesan cheese instead of the nutritional yeast.